Colorado is a home rule state and does not have a mandatory statewide energy code. For a list of jurisdictional energy code adoptions, please click here. Legislation passed in 2007 set the 2003 IECC as the minimum energy code requirement, applicable only to jurisdictions that had already adopted any type of building code or planned to do so in the future. 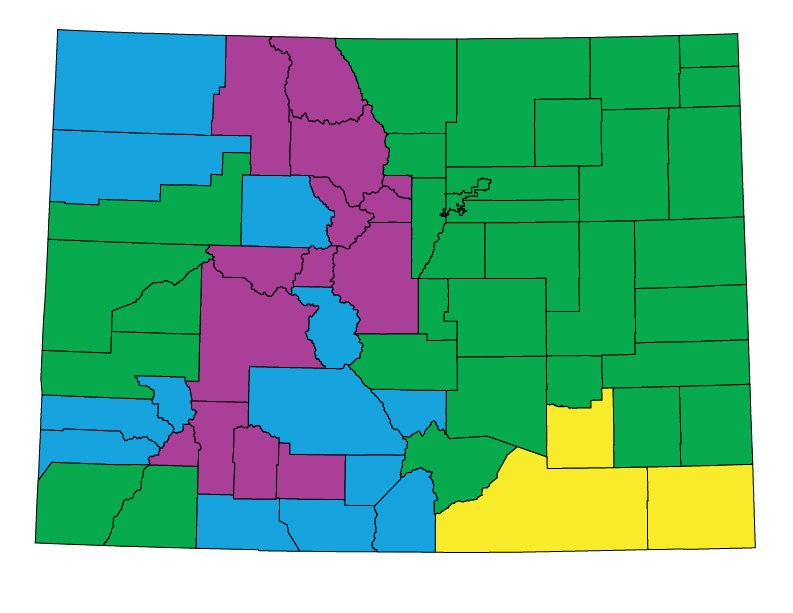 According to BCAP’s research as a part of its Compliance Planning Assistance (CPA) program, 97% of Colorado citizens live in jurisdictions that have adopted some version of the IECC; the 2003 IECC can be considered the de facto mandatory minimum code. Energy codes are not enforced at the state level, except for public buildings, manufactured and modular housing, and hotels and high-rise residential buildings in jurisdictions without an energy code. Local enforcement agencies in jurisdictions that have adopted building codes are required to enforce the provisions of the residential energy code at the local level, but may adopt their own requirements without state approval. Inspections are required as a part of the established building inspection process. The Governor’s Energy Office (GEO) works in close partnership with building departments to provide energy code training, information and other resources to support local adoption and implementation. The energy office also provides an Energy Code Support Partnership (ECSP) toolkit to support various stakeholders in the adoption of the latest model energy codes. Legislative: Local jurisdictions can and do adopt their own energy code requirements, but a statewide energy code would have to be promulgated by the state legislature. The legislature meets in regular session during January each year unless the previous year’s legislature amends the date of next convening through a joint resolution. June 13, 2011 The Denver City Council unanimously adopts the 2009 IECC in its update to the 2011 Denver Building Code for new home and commercial construction, renovations, and additions. This makes Denver the largest Colorado city to adopt the national model energy code. The new energy code will achieve approximately a 15 percent increase in energy efficiency compared to the performance of homes built to the current Denver energy code, and a 5 percent increase in energy efficiency for commercial building tenants and owners. The code takes effect on October 17, 2011. January 2010 The Governor’s Energy Office announces a wide variety of grant opportunities available as a result of the American Recovery and Reinvestment Act (ARRA). Grant categories include energy efficiency in historic buildings, renewable energy and energy efficiency projects in commercial and industrial settings, LEED for existing buildings, energy efficiency expansion and training, and innovative products and services. December 1, 2009 The City and County of Denver Development Services Department begins the public consideration of the 2010 Denver Building Code, comprised of the 2009 International Code Council (ICC) Codes – including the 2009 IECC – and proposed amendments. During a series of seven public hearings during early 2009, the Combined Board of Appeals (CBOA) heard stakeholders’ statements and selected the amendments to include in the 2010 Denver Building Code. The final version of the Codes will be submitted, as an ordinance, to City Council. When City Council approves the proposed ordinance it will contain rules for the transition from the current 2008 Denver Building Code to the new code. May 3, 2007 The state legislature passes HB 07-1146, improving the energy performance of the state’s new buildings as part of a comprehensive energy strategy that begins with energy efficiency and incorporates renewable energy technologies. HB 07-1146 calls for all Colorado jurisdictions that have adopted any building code (and those that do so in the future) adopt a minimum energy code standard at least as stringent as the 2003 IECC effective July 1, 2008. Since a large percentage of jurisdictions in Colorado fall under the former, HB 1146 is a de facto mandatory minimum code. However, some of these jurisdictions have been proactive about adopting and updating their energy codes on a three-year cycle. Many have already adopted or were in the process of adopting the 2003 IECC prior to the passage of the bill; others were working on adoption of the 2006 IECC or above-code measures. Having set the bar sufficiently low, HB 1146 functions more as a catalyst for slower jurisdictions to catch up. For the mostly small and rural jurisdictions in the latter category without building codes of any kind, it does serve as a mandatory minimum, should they decide to adopt a building code in the future. The bill also allows jurisdictions who adopt only the IRC to replace the energy provisions (Chapter 11) with the 2003 IECC. 1978 The Colorado legislature passes a law requiring all jurisdictions that have adopted building codes to include energy efficiency requirements for both residential and commercial buildings. The energy requirement at this time is based on Chapter 53 of the 1979 Uniform Building Code (UBC) – a codified version of ASHRAE Standard 90-1975. A sunset provision is included for commercial buildings requiring the legislature to specifically extend the provisions for those buildings. The legislature fails to act and the commercial requirements are terminated in 1980, except for jurisdictions that have adopted this code prior to this termination.